Logain Industries in conjunction with the Terran military have been adapting the existing PTP-FDL-T technologies for military application. The military required a solution to release needed resources from sector security operations to help stabilise borders and react to increasing enemy fleet incursions. Using FLT-P2P-T ( Faster Then Light Point to Point Transference) technology Logain Industries created a Strategic Sector Defence Network solution codenamed “Guardian”, a supplement to sector defences with an automated un-manned response. A SSDN Command Control Centre (SSDN - C&CC) integrates with the existing Advance Satellites network to identify, track and engage enemy targets within its sphere of influence. SSDN also incorporates Carrier based Drone Operation (was LSDC), when active and loaded with Drones the Carrier will teleport Drones to engage any enemy ship and recover remaining drones to its cargo bay. If you do not intend to use LI_Modv7 you will need to remove the following any script file starting “plugin.LI.Dock.xxxx”. Command Slot - COMMAND_TYPE_FIGHT_41. This is the same command as used by LSDC. SSDN now incorporates Carriers as a core feature; LSDC is still available as a standalone script. Script uses file 9911-L044 for text strings. Script used page 17 ID’s 300033 to 300034 for the SSDN C&CC description, the values are also used in the script to ensure the mod has loaded correctly. Changes to TDock .txt and HQ.xml are contained in the combined LI_MOD .cat file. This is a mod to the existing game files. Please ensure that all save games are backed-up prior to use. Many thanks to all who have contributed with comments & suggestions on this post. Many thanks to Apricotslice for hosting the files on his site. Last edited by Logain Abler on Mon, 25. Apr 11, 14:32, edited 63 times in total. Last edited by Logain Abler on Wed, 16. Sep 09, 09:44, edited 16 times in total. The SSDN.cat and .dat file can be placed in the mods folder or renamed to follow the game .cat and .dat files. Manually install files from the script.zip. This link contains a guide for installing script files manually. SSDN uses the AL Plug-in timer event for some actions. This menu shows the available Advance Satellites in the sector. 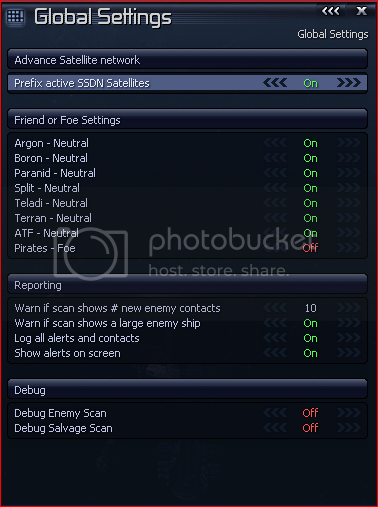 This menu is used to configure the Control Centres configuration, such as its active state, how it reacts to enemy contacts (Rule of Engagement) and it salvages captured ships. The menu is the same for Control Centres or Carriers with the listed exceptions. Combat Launch - Drones will be deployed by FTL-P2P-T in local space close to the carrier. The Drones will then make their own way to their target. After the engagement the Drones will be recovered to their home base using FTL-P2P-T. The Control Centre can use the deployed Advance Satellite network to claim bailed ships and can be configured to process the acquired ship. Recover – The acquired ship will be recovered as defined below. Move to – Move to a set position and await further action. This is good at moving the ships to a safe location for repair by ships equipped with repair lasers. 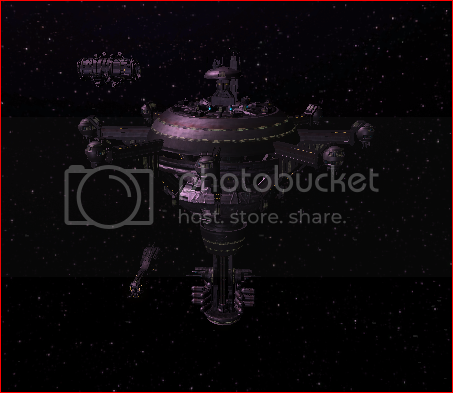 Dock at Station – The ship will dock at selected station. This is used for docking ships at your own stations or other access Shipyards for repair or sale. Dock at Carrier – The ship will dock at the selected carrier. The default ‘dock at’ setting will be the SSDN or Carrier. Last edited by Logain Abler on Mon, 15. Mar 10, 15:50, edited 84 times in total. Woot, go LA. wish you the best of luck getting this project off the ground. I look forward to some drone swarms. Last edited by Tasolth on Thu, 28. May 09, 21:06, edited 1 time in total. Tasolth wrote: Woot, go LA. wish you the best of luck getting this project off the ground. Still lots to do but the basics are sound. Hopefully I will be able to start playing again in about a week, so will be able to test for you when you ready. Thinks are moving along nicely. I have the SSDN CCC (Command Control Centre) up and running (using the FDN XL Node until I get around to using something else). Once deployed it integrates with all Adv Sat’s within a 4 jump radius, unless they are already under the control of another CCC. Each Sat runs a task with searches for and reports any enemy contact within its range to its CCC. The CCC then assesses the threat and response appropriately with MkII, Keris or normal Fighter Drones (no custom Drones as yet), depending what’s in stock. The target is monitored until killed, when the target is killed the Drones are recovered to their home CCC; if a Drone is destroyed it is replaced by another two (if in stock) to try and overwhelm the target. 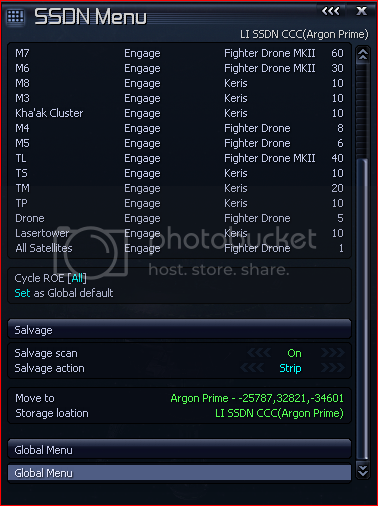 As a test (and for fun) I deployed a CCC in Argon Prime, stocked it with 10k of each Drone and set Argons as Enemies. It decimated Argon space , the only ship that survived was Argon One…….. Never seen a race relations drop so fast! I did deploy 12 over the map and then set everything to enemies, bit over the top I know, and it did kind of slow things down. Currently there is only one menu which lists the CCC and their linked sectors; from there the sectors can be set to on/off. Add levels of response for each sector, thinking of the below, settable for each ship class. Link the CCC to local Drones factories to stock/maintain drone levels. If the preferred drone is not available it goes to the next one, and so on. The number of drones deployed is just a rough number at the moment. Last edited by Logain Abler on Thu, 28. May 09, 15:02, edited 1 time in total. This is one of the menus/reports I'm working on. This tracks the Drones and engagements. Clicking on the blue header refreshes the report so you don't have to leave it for it to update. The drone rows will open up a list of lost drones, where and who killed then & a list kills for that drone type. The FDN Node XL is just a place holder I'm using for testing. How can you have destroyed and killed when none were deployed ? Maybe this means, that there are no drones deployed at the moment? Anyway, I'm looking forward to this. How does this work IS. I never tried soo many drones IS - are they still as effective? apricotslice wrote: How can you have destroyed and killed when none were deployed ? It's a record of all the kills & losses so far, it racks up over time. I'll be adding a reset to clear all the counters. As for in sector it looks to work fine, but I think the loss rate of the drones will be higher, especially against capital ships. 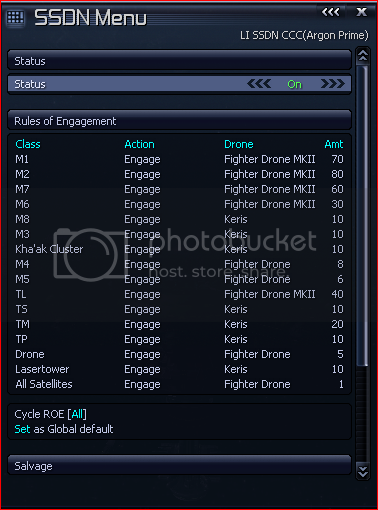 I'll be adding an engage by class filter so you could engage fighters with drones and hit capital ships with your own fleet. 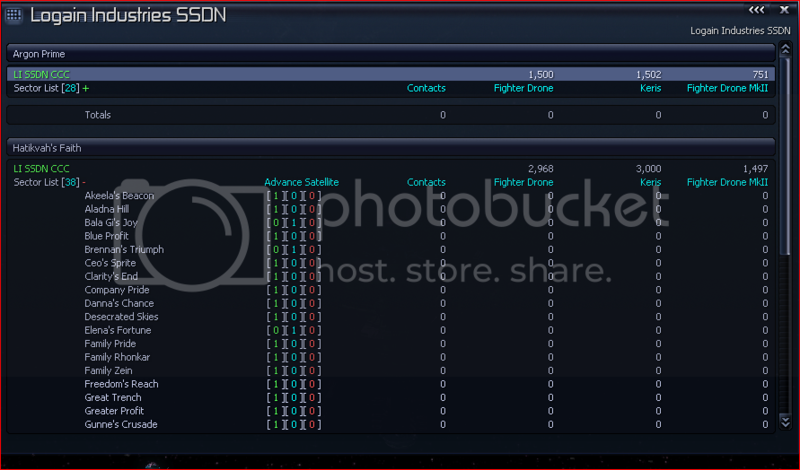 I have the SSDN Command Control Centre menu mostly done with all the elements linked in. - I'm still working on the main summary page which will list each SSDNCCC deployed and what Sectors they cover.